Long before the US entered the war a number of men from Hawaiʻi had entered the Army and Navy. The preparedness movement of 1915 and 1916 and the creation of Army units stimulated the enlistments. When the US was actually in the war, the local interest increased. On April 6, 1917, two days after the US Senate voted 82 to 6 to declare war against Germany, the US House of Representatives endorsed the decision by a vote of 373 to 50, and the US formally entered the First World War. At the time, the US Army was comparatively small. On May 18, 1917, the Selective Service Act was passed authorizing the President to increase temporarily the military establishment of the US. The Selective Service System was responsible for the process of selecting men for induction into the military service, from the initial registration to the actual delivery of men to military training camps. It was a “supervised decentralization.” Folks in Washington were responsible for formulating policy; Governors of the 48 states, the District of Columbia and the territories of Alaska, Hawaiʻi and Puerto Rico managed the operation of drafting men for military service. Local boards were established for each county or similar subdivision in each state, and for each 30,000 persons (approximately) in each city or county with a population over 30,000. 4,648 local draft boards were spread across the country; they were responsible for registering men, classifying them, taking into consideration needs for manpower in certain industries and in agriculture, as well as other deferments, determining the order in which registrants would be called, calling registrants and getting them to training centers. The order numbers for Hawaiʻi’s registrants were not determined by the drawings held in Washington, but by special drawings held in Honolulu. For Hawaiʻi, President Wilson, on recommendation of Governor Pinkham, named July 31, 1917 as Registration Day, and on that day all men in the territory between the ages of 21 and 30, both inclusive, except members of the National Guard and those in regular service, were required to appear at their draft board. In order to insure a complete registration, an extensive publicity campaign was carried on. The President’s proclamation was translated into Japanese, Chinese, Korean, Portuguese, Spanish, Hawaiian and the three Filipino dialects of Visayan, Ilocano, and Tagalog. OK, other than a slight modification in the selective service selection process, that’s pretty straight forward; was there any other quirk in the Hawaiʻi process? In reviewing World War I service records, one of the categories on the standard form is “Race: White or Colored”. It seems that some Hawaiians who served in WWI were noted as “Hawaiian;” however, there are others who were identified as “White” on their service cards. The image shows David Piʻikoi Kahanamoku’s military service record and his passport photo. In addition, I have added other images in a folder of like name in the Photos section on my Facebook and Google+ pages. Before we expand on this, let’s look back – both in Hawaiʻi and elsewhere. Lydia was eventually titled Princess, and later became Queen Liliʻuokalani, in 1891. John Owen Dominis died shortly after becoming Prince consort (making Liliʻuokalani the second widow of the mansion;) title to the home then passed to Queen Liliʻuokalani. On April 2, 1917, President Wilson appeared before Congress to deliver his historic war message and asked for a declaration of war against Germany. (history-com) Then as Congress convened, two more ships were sunk, the large freighter Missourian and the schooner Marguerite, with no casualties aboard either ship. On April 6, 1917, after twenty-nine months of official neutrality, the US declared war on Germany, formally entering World War I. 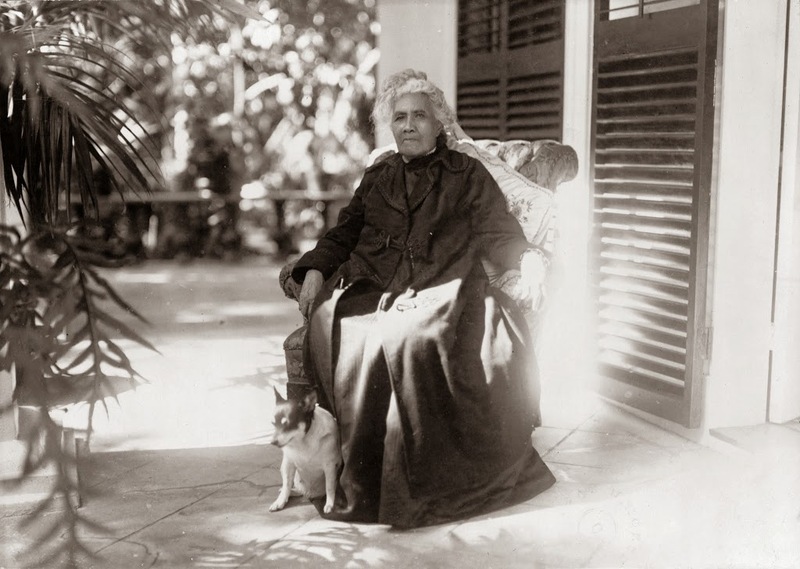 The image shows Queen Liliʻuokalani at Washington Place in 1917.